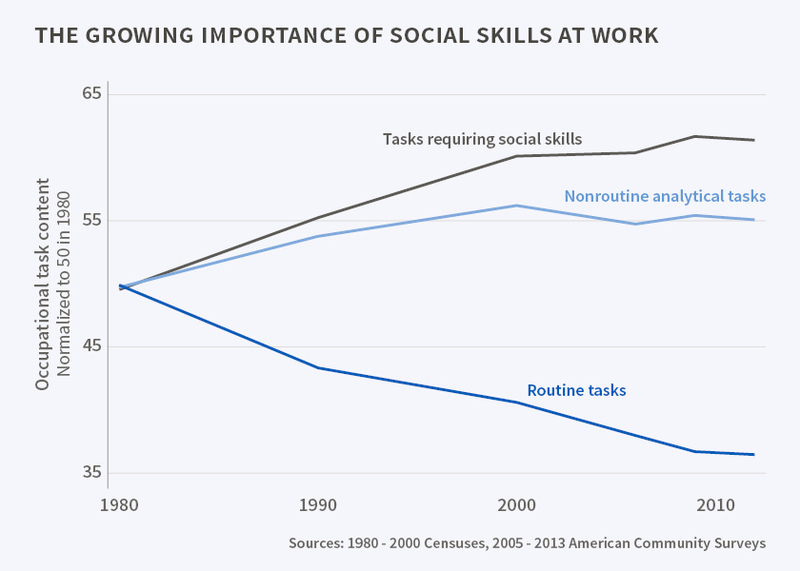 How important are social skills at work? This article is published in collaboration with The National Bureau of Economic Research. Automation has played an important role in the recent evolution of the U.S. labor market, transforming the rela­tive demand for workers with various skills and in different occupations. In The Growing Importance of Social Skills in the Labor Market (NBER Working Paper No. 21473), David J. Deming demonstrates that high-paying, difficult-to-automate jobs increasingly require social skills. Nearly all job growth since 1980 has been in occupations that are relatively social-skill intensive, while jobs that require high levels of analytical and mathematical reasoning, but low levels of social interaction, jobs that are comparatively easy to automate, have fared comparatively poorly. Social skills are important in the modern labor market because computers are still very poor at simulating human interaction. Skill in social settings has evolved in humans over thousands of years. Human interaction in the workplace involves team production, with workers playing off of each other’s strengths and adapting flexibly to changing circumstances. Such non-routine interaction is at the heart of the human advantage over machines. The growing importance of social skills can potentially explain a number of other trends in educational outcomes and the labor market, such as the narrowing – and in some cases reversal – of gender gaps in completed education and earnings. Deming explains the importance of social skills by observing that workers naturally vary in their ability to perform the great variety of workplace tasks. Teamwork therefore increases productivity through comparative advantage. He suggests that the benefits of teamwork can only be realized through costly coordination among workers, and he models social skills as a reduction in worker-specific coordination costs. Workers with high social skills can “trade tasks” at a lower cost, enabling them to work with others more efficiently. Deming tests this framework’s predictions about the sorting of workers and the relative returns to skills across occupations. He finds that the wage return to social skills is positive even after controlling for cognitive skill, non-cognitive skill, and a wide variety of other determinants of wages. He also finds that cognitive skill and social skill are complements in the determination of wages, and that skill complementarity has grown over time. Finally, he finds that workers with greater social skills are more likely to work in social skill-intensive and less-routine occupations and to earn a relatively higher wage return in these occupations. While Deming does not address where social skills come from and whether they can be affected by education or public policy, he suggests the possibility that increases in social skills are a key mechanism for the long-run impacts of early-childhood interventions. He notes that if social skills are learned early in life but are not expressed in academic outcomes such as reading and math achievement, and if they are important for adult outcomes such as employment and earnings, this would explain how the impact of early interventions on test scores could decay over time even though the impact of these interventions on earnings could remain substantial. Author: Les Picker is a writer at The National Bureau of Economic Research. Image: Man works with one of his assistants in his office. REUTERS/Tony Gentile.